Art-in-Bloom is our nation's most celebrated collaboration of the fine art of flower arranging with the fine arts of our museums. Pauline has lectured for this event throughout the United States. She delights in sharing her design perspective and secrets on how to create a large scale arrangement with a big WOW factor! A masters workshop often follows this unique and powerful demonstration experience. This lecture encompasses slides of flowers from Nantucket fields to restored period gardens. The lecture is a spring to fall presentation and is designed to capture the excitement of the avid gardener, flower arranger and naturalist. Beautiful presentation of spectacular on-location weddings. Tips on how to plan a wedding and have fun doing it. presented at the Museum of Fine Arts - Boston for Art-in-Bloom. A very special slide lecture of private gardens...from the very famous in California, East Hampton, Mount Desert Island, and Connecticut...to the yet unrecognized, but most creatively artistic gardens in the Northeast. A real jewel of a lecture. Pauline Runkle fulfilled a life time dream when she was chosen as a Tournament of Rose's judge: One of three to participate each year. This beautiful lecture captures the joyous spirit and dynamic history of one of America's living legends. This slide lecture captures the aesthetic beauty of Japan during Cherry Blossom season, the excitement of the Osaka Wholesale Market, Floral Arrangements from the Japanese Association of Flower Arrangers International Show in Osaka, Historic Temples and Exquisite Gardens. Pauline's garden has been featured in Horticulture and Victoria Magazine. This is a step by step lecture on how to take a four acre "pig" farm and turn it into a garden paradise...a place for contemplation and renewal. The site now encompasses an orchard, meadow, herb, rose and perennial garden. Pauline has traveled from Dounan, China, the largest flower market in Asia to the flower markets of Kenya, Paris, Nice, Italy, Holland. This visually beautiful lecture traces the path of the flower from grower to your bouquet. Catch the excitement of the lecturer as you listen to Pauline's exciting adventures in pursuit of her quest for the life of the cut flower. "A photographic journey to Suzhou, China and Kyoto, Japan: Historic cities of poets, painters and gardeners." From the Rain Forest Alliance to Floraverde and Veriflora. Ethical discussion about sustainable agriculture and social responsibility. The hands on creation of a Gratuity Wreath connects our consciousness to the bounty of our magnificent physical world while reaching into the depths of our emotional being. While harnessing our innate creative nature and talent, each element of the wreath is chosen for its symbolism (rosemary for remembrance), fragrance (lavender and scented geraniums), and meaning in one's life. With all flower arranging, the basic elements of design play strongly in the beauty of the finished wreath. Balance, rhythm, texture, and a sensitivity to materials will all be valued as the circle of the wreath completes its personal message. With social responsibility part of every arranger’s vocabulary, designing has taken on a new dimension. Flower market selections carry a myriad of labels such as Rain Forest Certified, Organically Grown, Veriflora, etc. Resources from the home garden become more of a viable option. This lecture leads the audience through the design process in a thoughtful manner. It takes inspiration and imagination and asks the arranger to look at social responsibility and sustainability as well as structure, line, color, texture, form and pattern. Pauline designed this lecture to uses the art of flower arranging to excite creative energies and affirm creative talents. Her lift time goal has been to help people unleash their own artistic potential. Her naturalistic style of designing uses materials in beautiful and imaginative ways. Designing with exquisite materials is a Pauline Runkle trademark. An exciting demonstration using romantic flowers to create dramatic arrangements in antique containers. This lecture was originally designed for House Beautiful Magazine audiences to encourage the entertainer in us all and to develop his or her own personal floral decorating style. Arranging techniques, new and unusual floral varieties, and a host of delightful and interesting special event experiences will be shared. In this special lecture/demonstration, Pauline will reflect upon her personal relationship with her flowers, her craft and her professional journey. As an arranger to as diverse a clientele as John Williams of Star Wars fame, Tiffany's, Epcot, The Tournament of Rose, and Dalai Lama of Tibet, Pauline has moved through many years and many phases of an artistic life. Her arrangements reflect her sensitivity to nature and to her garden. One can feel just what flowers have brought to her life through her movement and her language. Beautiful and unusual plant material is artfully combined to inspire the audience to look at their own lives through their relationship with spirit, joy and nature. 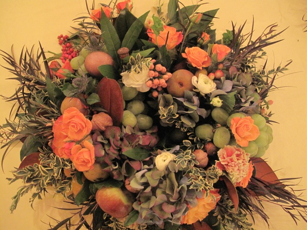 Discover the joy of arranging flowers with fruit. Design and mechanical techniques will be discussed and demonstrated. Luscious masterpieces will be created! Special mechanics make decorating for the holidays a snap. Have a look at what is new in mechanics, materials and design. Be inspired to make your holidays a fun filled floral adventure without the floral stress. On behalf of the Winchester Garden Club, I want to thank you for your exquisite holiday floral presentation. We thoroughly enjoyed your warm manner, unflappability, stories and elegant designs. Never have we had a program with so many beautiful blooms. You enriched the holidays for us all. It was a great pleasure meeting you. I hope to see you again in a workshop in your barn in the Spring. Pauline has had extensive experience in making fundraisers successful. Let us help you design an event that is exciting, fun and profitable. "A Painting, A Painter, and A Floral Artist: An Interactive and Interpretative experience in Creativity." Pauline originally created this highly successful fundraiser for the museum at Wellesley College. This interactive lecture incorporates a painting from the museum's collection, a watercolorist and Pauline. During the presentation a small camera is focused on the progress of the painter as he or she is interpreting the painting in watercolors. This work is projected onto a large screen next to a slide of the painting that was selected. At the same time, Pauline is creating a large sculptural arrangement in flowers that reflects her impression of the same selected painting. There is a dialogue that happens between the painter and the floral artist. Period music of the painting's era is playing softly in the background. After the presentation, the watercolor is auctioned or raffled off. 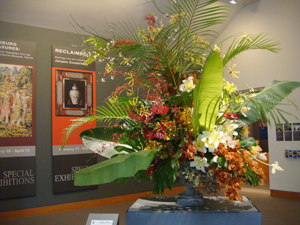 Pauline's arrangement stays in the museum or botanical garden on display. The afternoon has a fabulous option for a master class held by Pauline for the flower arrangers and one given by the watercolorist for the painters in the audience. Planned for Spas, Botanical Gardens, Museums and Garden Clubs looking for in depth floral and/or landscape emersion for a specific occasion or group. Any combination of slide lectures and workshops can be designed with a custom focus. All of Pauline's workshops focus on developing the artistic ability of each participant with the belief that each of us are endowed with our own creative talent. Sessions are participatory and filled with joy! Workshops can be provided separately or in conjunction with slide lectures or a demonstration to provide a full day flower arranging experience. These workshops will feature instruction with an emphasis on working with garden flowers in the gardenesque style. Full day workshops include a tour of Pauline's garden (featured in Victoria Magazine, The Boston Globe, Horticulture and other magazines), notes on planting a garden for flower arranging, a flower arranging demonstration and personal arranging time. Full day participants are invited to bring their lunch and enjoy picnicking in the garden. Half day workshops include a garden tour, demonstration and a hands on workshop. On going flower arranging weekly workshops are available for groups and individuals at the garden at Three Plum Hill. Classes focus on growing and using plant material for naturalistic floral designs. The mechanics and fundamentals of distinctive design are taught while honoring the creative potential of each student. For complete information please call Pauline at 978-526-4159.